Higher test scores in science and writing. Greater participation in student government and school service clubs. Thanks to its many renowned arts programs, Indiana University enhances the lives of countless individuals in communities throughout Indiana and beyond. For example, the IU Jacobs School of Music is working with public schools to enhance their music class offerings, with a particular focus on partnering with low socioeconomic schools. 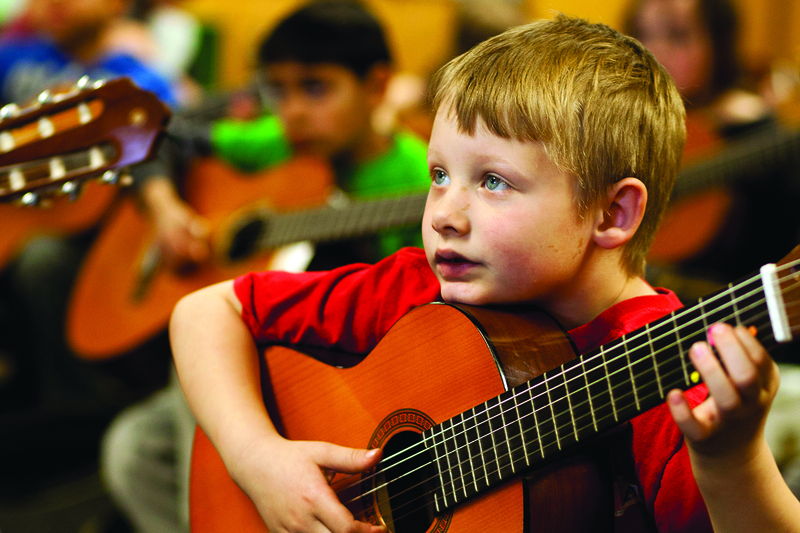 At Templeton Elementary School in Bloomington, Indiana, first- and second-grade students are learning how to play the guitar. The program’s curriculum was designed by Katherine Strand, associate professor and chair of music education, and Petar Jankovic, lecturer of guitar. Strand and Jankovic have found that working in collaboration with the music teacher at Templeton provides the best possible experience for the students. Another key component to making the guitar classes successful is the involvement of IU students. While a lead teacher instructs the class from the front of the room, students from the Jacobs School of Music assist the elementary school students. They help them stay focused, get the right finger placement on the guitar strings—whatever the kids need to stay on task. In doing so, the IU students are also gaining valuable experience in teaching. “I enjoy working with the students because they have such a unique view of the world and it's great to see them discovering the world and discover themselves through music,” says Luke Foster Hayden, an IU music education major. And it’s not only the Templeton music teacher or the faculty members and students from IU who are contributing to this program. Donors are also a driving force behind it. And the investment of time and money from all these individuals is changing lives. 1 Catterall, James S.; Dumais, Susan A.; Hampden-Thompson, Gillian; “The Arts and Achievement in At-Risk Youth: Findings from Four Longitudinal Studies”; National Endowment for the Arts.